1.) It’s FRIDAY. TGIF, amirght people? Last weekend was less of a weekend and more of a whirlwind cycle of parties and it was wonderful. Absolutely wonderful. We saw amazing people and family and friends and I am so, so, glad that my kids are growing up with such a wonderful network of extended family and friends. I would so much rather they have that than be on their own. 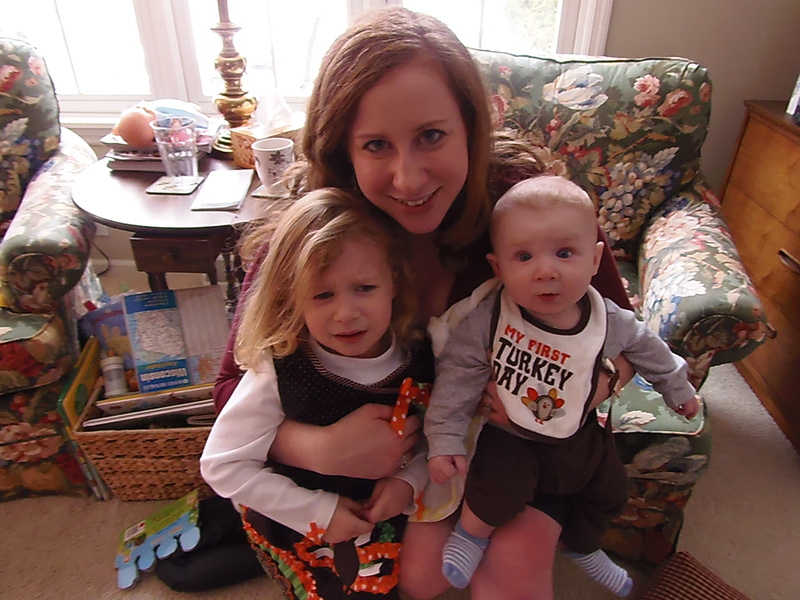 And I got to dress them up in cute clothes. Which is always a plus. But, dude, I am tired. Most summer weekends are like that, right? Weddings, showers, parties, birthdays, whatever. Wonderful stuff that you love participating in, but a bear to schedule. Except you know what? Tomorrow? We have NOTHING. An entire day when I don’t have to put on real pants. I know. (Which I’ve said one too many times, it appears because Sqeaks has taken to repeating, “We wear pants in this household,” which is my usual response to her desire to spend most of her days in various states of undress.) It’s pretty exciting. 2.) Also (kind of) exciting and (kind of) horrifying is that I packed away all the baby stuff yesterday. I’m in the process of packing the things we don’t really use and getting them ready to move and I realized that yup. We don’t really use the bottles anymore. I know he’s not a year yet, and nobody crucify me, I still give him formula and we avoid milk and don’t arrest me, blah blah blah. But the bottles have stopped. He’s never liked them, and we’d gotten down to two two-or-three-ounce ones a day, just kind of right before bedtime and naptime. More out of habit than anything. He wasn’t drinking them. I was pouring money into a bottle and then letting it sit on the edge of the coffee table while he passed out sweetly. 3.) In other news, I had time to pack away the bottles because I’ve been trying to get Buddy to nap normally. He’s a champion sleeper at night- 11 to 12 hours, put down awake, not a peep out of him, etc. If there’s anything I’m proud of in my parenting it’s that Squeaks says the Hail Mary when she hears a siren (although that’s really more because she’s enamored with our priest) and that I stuck with the bedtime routine through all those horrible early weeks and got him sleeping through the night. Naptime isn’t that great, though. Everything that I worked so hard to make sure happened at bedtime I just kind of ignored with naptime. We’re always in a different house, he wasn’t ever a good napper, all the typical excuses. For the last few months I’ve been letting him fall asleep in my arms around one pm and then sleep next to me while I rested or hung out in the room for a few hours. And this worked great. I got some downtime, and he got the sleep he needed. Except remember that weekend I was talking about above? Yeah. It broke him. We spent Tuesday and Wednesday literally crawling up my chest to avoid falling asleep. Fun for the whole family. So yesterday I buckled down. At home, in the crib, regular naptime. We’re not exactly a cry-it-out family in that I won’t let them just scream and scream forever, but once I’m sure he’s comfy and not scared and just mad that I’m not in the room with him (how DARE you!) we’ve let them cry fora few minutes. And after a day or so this always works. So yesterday was not to much fun. He stayed in his crib and “slept” the requisite number of hours, but he woke up every hour or so to voice his displeasure that he did not have company. I cleaned the cabinets and put away bottles and ate half a loaf of banana bread because I am adept at eating my feelings. Today should be better. God willing. 4.) Speaking of cleaning the cabinets, I did our pantry cabinet yesterday. Which is a sucking black hold of taco shells and bread crumbs because I apparently just buy a new container of them every time I cook with them. I refuse to box up and move a bunch of expired pancake mix. I discovered three potatoes that must have fallen out of the bag. They had sprouted, like, trees. Also a bag of black mold that (according to the label) used to be hamburger buns. We haven’t had hamburgers since last summer. Oh wow. 5.) Totally unconnected, Buzz has this day-long company philosophy meeting thingy. 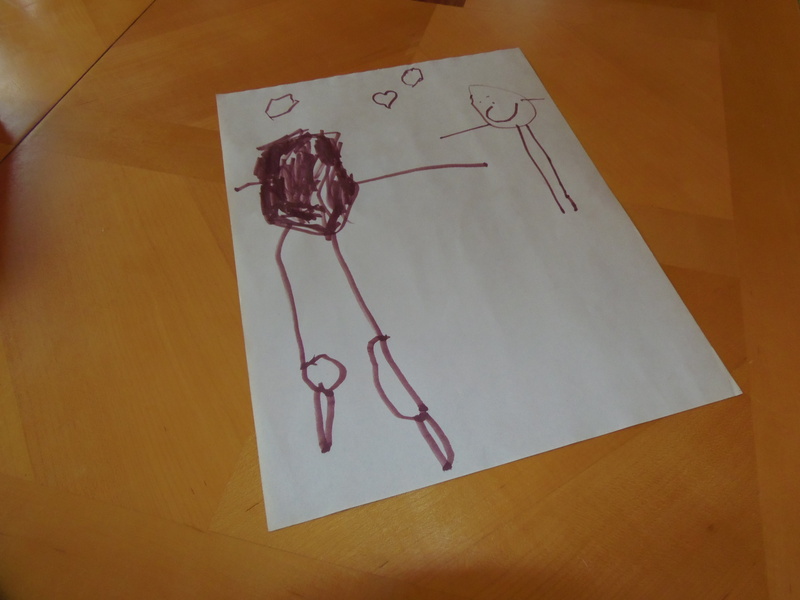 He has to bring something of deep personal significance to him, and he wanted to bring a picture of me and Squeaks and Buddy. I, of course, had to vet the picture first. Because if the last picnic was any indication, his company is staffed by the hottest biochemists around and I am a little bit vain. Buzz did not like my selection. “I look high!” he protested. Yeah. Well, you’re at the meeting. They can see you’re adorable. You guys. I’ve discovered a new show- Million Dollar Listing. It is glorious. It’s hilariously earnest about things that absolutely don’t matter just like the Real Housewives shows, and features a series of fabulous gentlemen brokers with shellacked hair, tans that don’t quit, and wardrobes that definitely cost more than my car. They have little hissy fits, and make more money than I’ve ever seen on single commissions, and generally exist in a Bravo-created world that in my fairly inexperienced opinion, doesn’t exactly exist in the real world of buying and selling homes. I’m fairly certain when we sell our house, it will involve something a little bit more like this. Oh! Hi! Are you here to see the house? Awesome. Yeah, we really need to sell it. Like, fast. 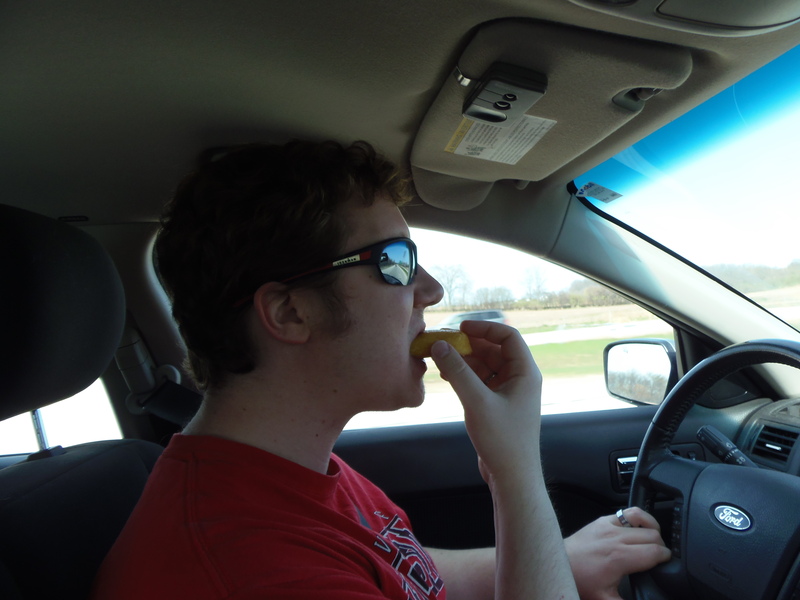 I am sick of driving. Champagne? No, we don’t have any champagne. Uh, I might be able to find some apple juice the kids didn’t drink…wine? Nope. That’s mine. Don’t touch. As you can see, there are lots of windows that haven’t been cleaned since my mother-in-law stayed here. But, uh, they’re pretty! And it’s an open concept which- Buddy! No! No no! That’s not for you!- uh, I hear that a lot on HGTV. It’s good. Definitely. Um. Three bedrooms. Perfect for separating children who were SUPER excited to be a big sister when you were pregnant and then once the screaming, wriggly, red thing came home quickly changed their minds- Squeaks! Get Buddy away from there!- anyway, lots of room. Attic? Yeah, there is one. I don’t know, I’ve never been up there- Squeaks! Get off of there! Uh, basement. You can hardly hear the kids from down there. I used to take naps down there when I was pregnant. If you open the vent it’s not dangerous- you can hear screaming, I mean, just not like the normal everyday, “I see imaginary monsters and I’m scared come get me” stuff…uh, room for a lot of exercise equipment we don’t use! And an elliptical that gets ooh, gosh, maybe 20 minutes of use a day four or five days a week. I know. I’m in pretty good shape- BUDDY. NO. THAT’S A NO NO. Diploma frames? Oh yeah, those are ours. Yeah, I used to be accomplished. Empty? Oh, yeah, I know. Well, see, I have the degree I just need to call and clear up some clerical oversight- BUDDY SERIOUSLY STOP IT- um. Bar! We have a bar! It’s awesome. I love it. Um. Bathrooms…yeah, I don’t know, they’re nice? Lots of room for you to puke when you have morning sickness or pre-eclampsia? I don’t know if that’s a concern for you…are you married? Does your wife have a history of high blood pressure in her family? Anyway. New plumbing. Teeth marks? On the door frame? Nope. Uh, don’t see them. I don’t know what you’re talking about. Our son does not chew at woodwork like a rabbit. Absolutely not. So as you can see, it’s a great house. Are you interested? You know what? Let’s open that wine now. It’s afternoonish. Ooh, I almost forgot! 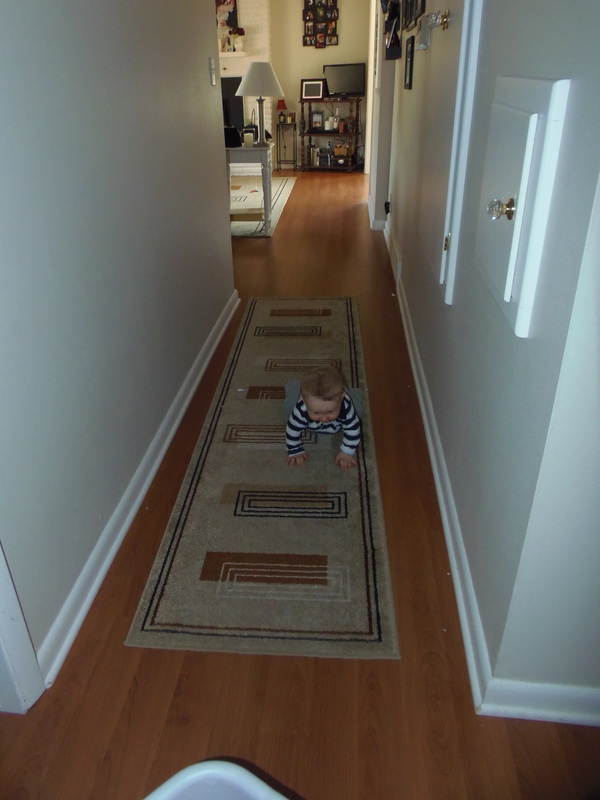 The hallway that your kid can crawl up and down for hours! Perfect! It’s like a baby racetrack! 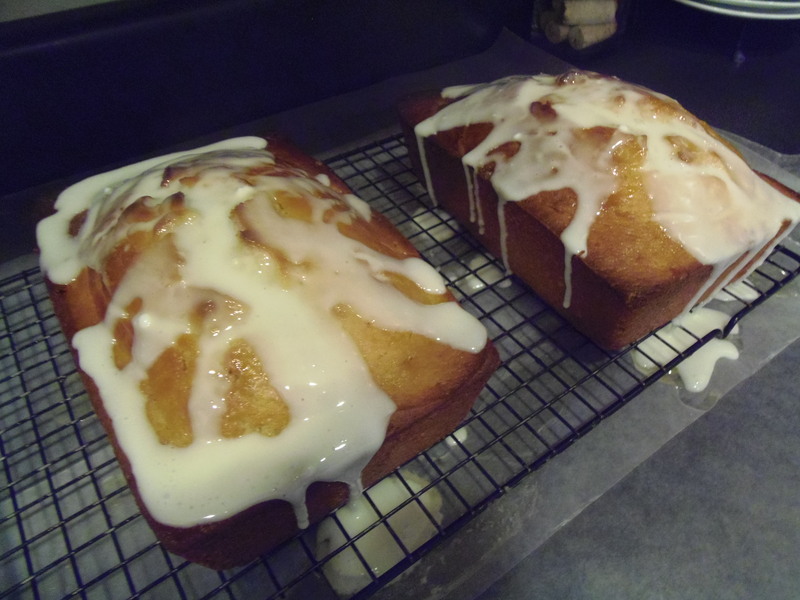 Of course I love Starbucks lemon loaf cake, and this recipe is very close to it. Except without the annoying little card in front telling you the thing you ordered is 470 calories. You know that card? I hate that card. I know that lemon cake isn’t healthy. You don’t have to tell me exactly how unhealthy it is. Geez. Thanks, Obama. ANYWAY. I make this whenever I have to take treats to something, because it seems super impressive and really isn’t that hard. Preheat oven to 350 degrees. Grease a loaf pan (one of the small ones that I’m sure has official size that I don’t know works well- you want the bread to be thick.). 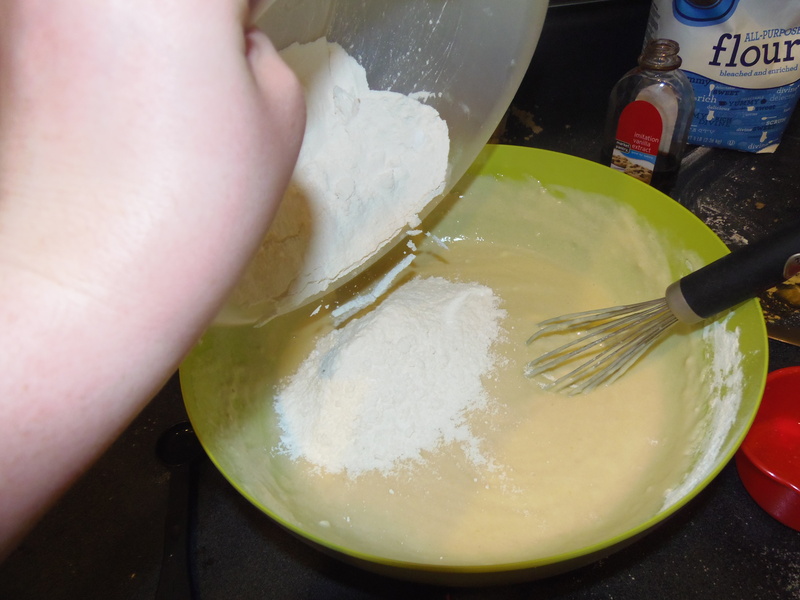 In a medium bowl, combine the flour, baking powder, and salt. 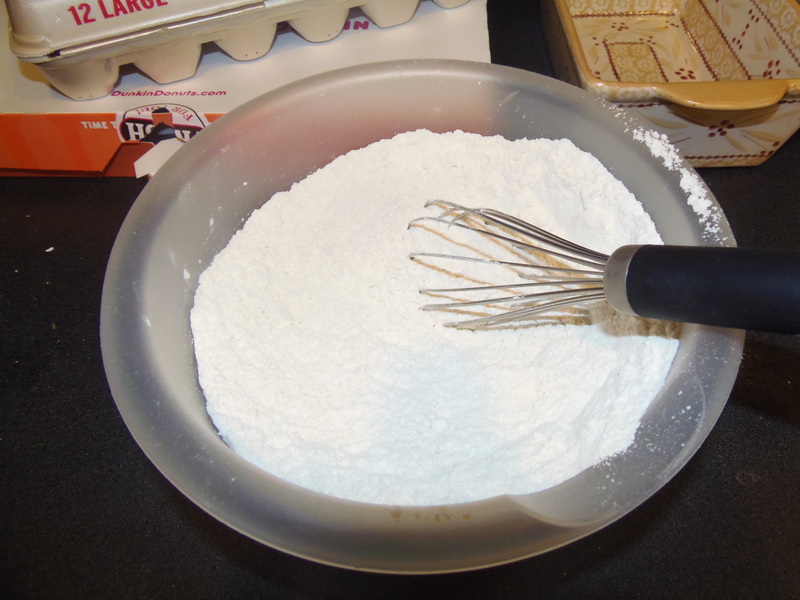 I use a whisk to avoid all that tiresome “sifting” business. 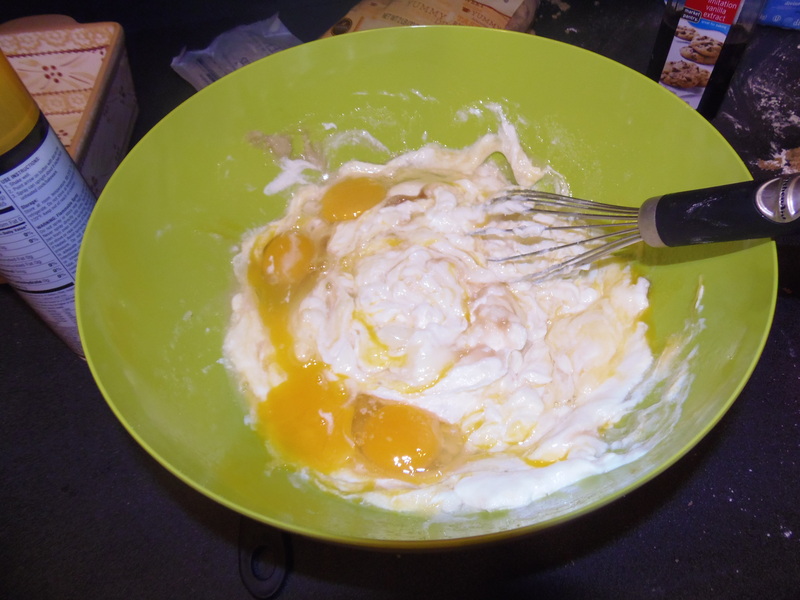 In a large bowl, combine sour cream, sugar, eggs, lemon extract, and vanilla extract. Add the dry ingredients to the sour cream mixture. You’re supposed to do this slowly. I usually don’t. Use a rubber spatula to fold the vegetable oil into the mixture. 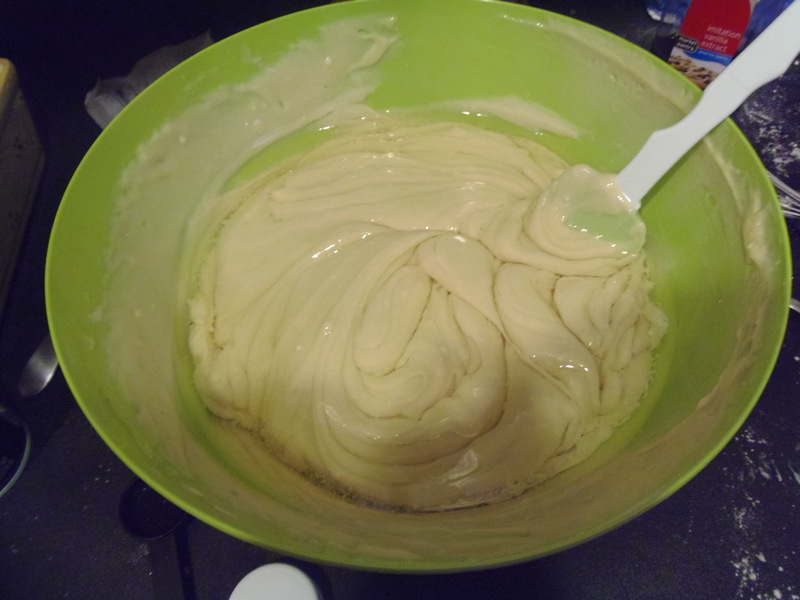 Which gives you the most awesome-looking unhealthy oily cake mix ever. Pour into loaf pan and bake for 60-70 minutes, depending on your oven. Like I said, I use the smaller loaf pans so it’s taller, and it takes a little bit longer to bake. 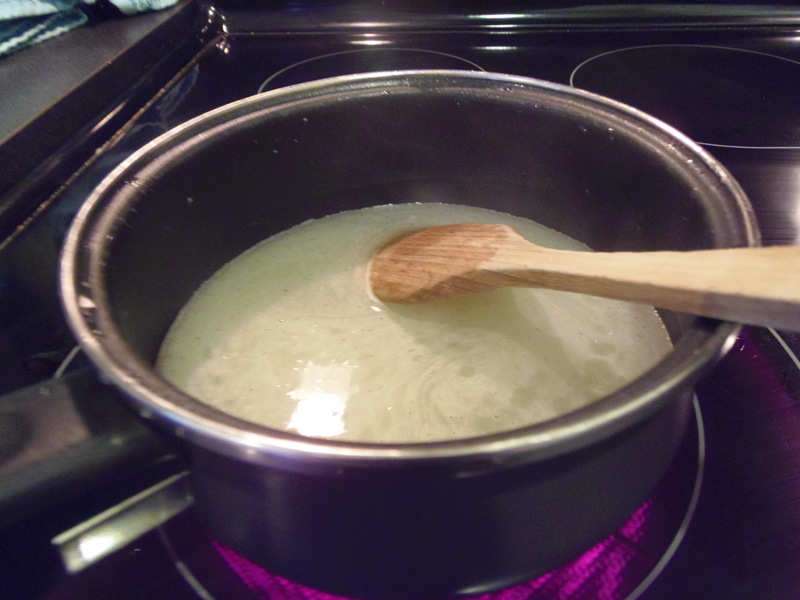 While the cake is baking, whisk the syrup ingredients in a saucepan over medium heat. Stir until the syrup thickens and clears. While the cake is still warm, place on a baking rack with something underneath it (otherwise it will be very messy. Something I learned the hard way.) Poke holes in the cake with a meat thermometer or other slightly thick pointy thing. 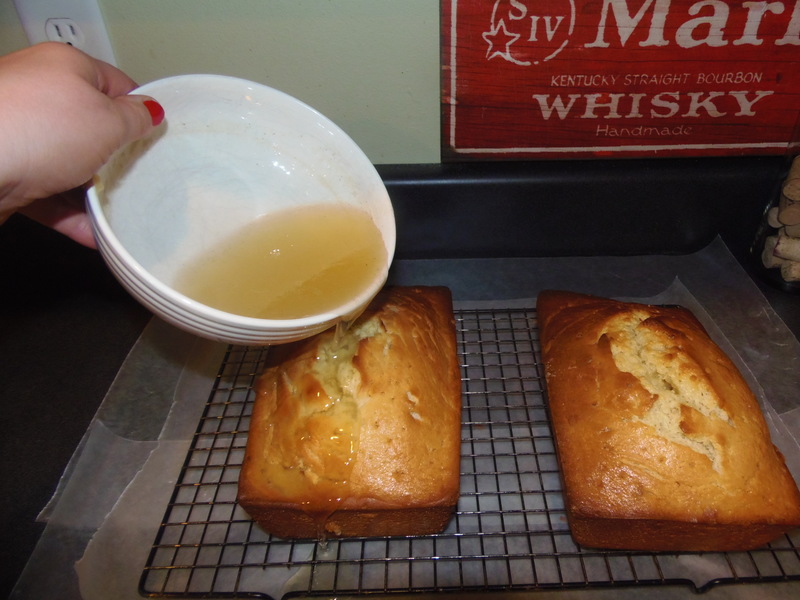 Pour syrup over the cake and allow to cool completely. 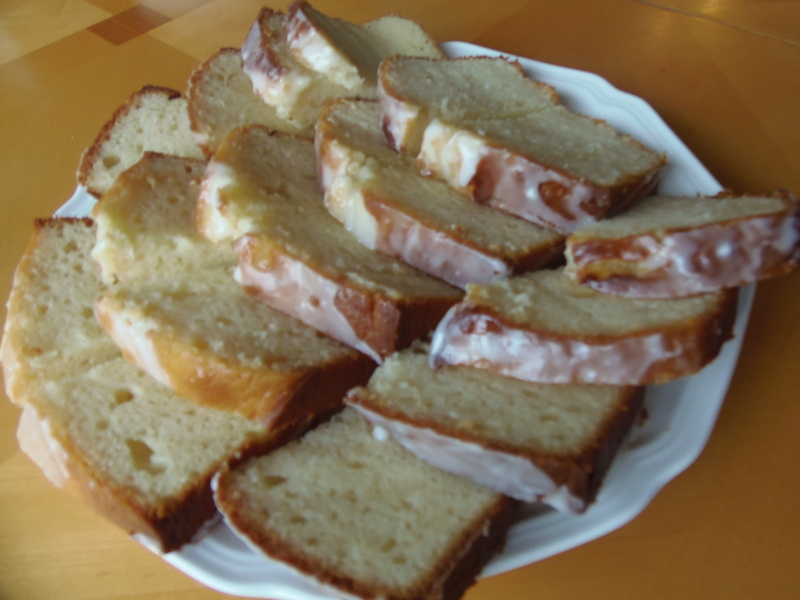 When cake has cooled, mix glaze ingredients together and pour over the cake. Five things which didn’t warrant their own posts this week. 1.) Dude. Spritzers. 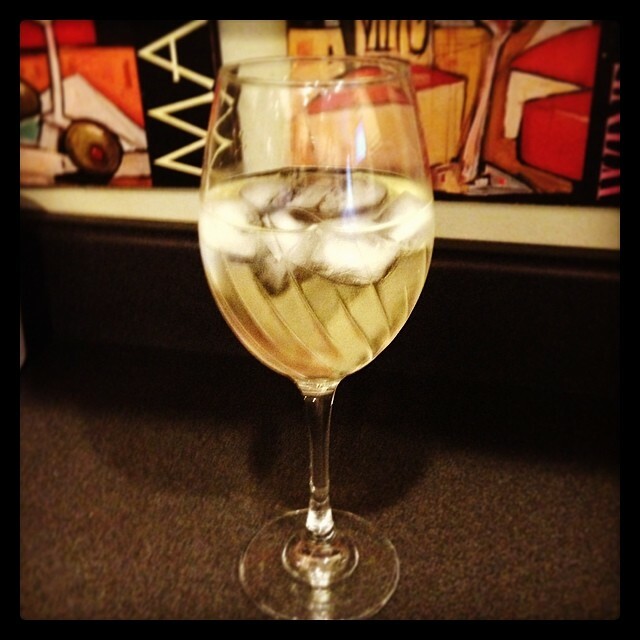 Wine spritzers. I’ve gotten totally into them. I used to be able to drink almost anyone under the table, but since having Buddy I’ve become a total lightweight. Like, one glass of wine and I am definitely tipsy. Two and I am no use to anyone. But I love wine. So I figured cutting it with soda was a good way to cut down on the alcohol and the calories and oh my gosh you guys, it totally is. I’ve done it with white wine, red wine, blushes, pretty much everything that I don’t like drinking on its own. (Another useful point- it uses up wine you’re not crazy about.) Lemon-lime soda (diet, because the calories are more immediately worrisome than the aspartame…I’m going to get cancer anyway, really.) is tastier than club soda, but hey, I guess whatever blows your skirt up. I’ve added bitters and berries and seriously. Changed. My. Life. Yes. My transition to sexually frustrated soccer mom is almost complete. 2.) Buddy climbs up stairs now. Oh. Good. Because I was feeling like I almost had it under control with him just scooting around flat surfaces. And we’re moving to a house with several floors in a shockingly small number of weeks. It almost makes up for the fact that he’s constantly searching for new and exciting ways to maim or kill himself. 4.) We went to the zoo yesterday because it was 9:02 and I had already almost lost my temper and figured we all needed to get out of the house. 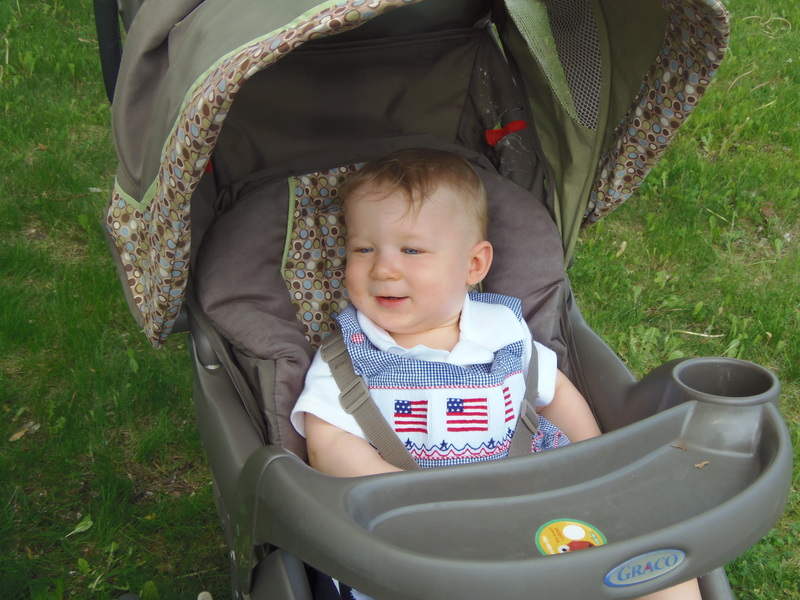 I even figured out how to work the two-kid stroller, which has eluded me for the past 11 months, despite the fact that I’m relatively intelligent and possessing of several degrees. None of which taught me about strollers. 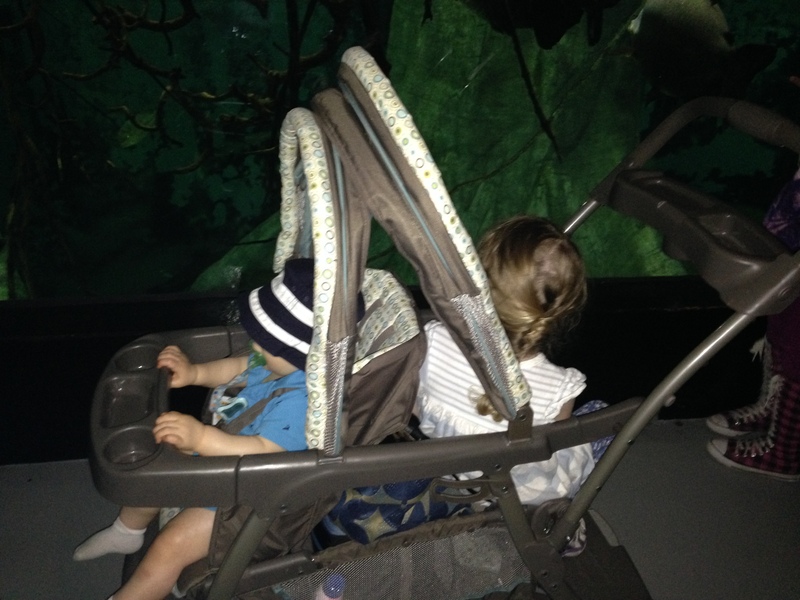 Or how to control two children at the zoo. 5.) Buzz is off today after two awful weeks at work. Like, he left so early and got home so late he didn’t see Buddy (literally) until last night. We have a very exciting day of grass-cutting, house cleaning, and hair-washing planned. And then hibachi. Lest we forget that we’re still relatively young. This has been a bad week for my youth. I’m only 26, but in the last year or so there are definitely moments when I’ve thought “Absolutely not, I am too old for that…stuff.” A LOT of them happened this week. I’ve been cleaning the basement and getting ready to move. I have a tendency to never throw anything away, and so I have clothes from literally every size I’ve been for the past six or so years. I have been A LOT of sizes, just fyi. So I was sorting through them, and found myself going, “Nope, never again,” to things. And not just because they’re an absurd size that happy I-have-two-hours-every-day-to-exercise-and-I-hardly-ever-drink-and-eat-a-lot-of-broccoli! grad student me was and post-childbearing is-it-five-o’clock-yet? me will never, ever be again no matter what. But because grad-student me looked pretty ironically hot in the short plaid skirt and screw-me boots. Post-childbearing me (who still loves the boots, just with jeans or a tasteful skirt) would look ridiculous. I got super excited over organizing my seasonal decorations. Yup. Just read that sentence. Literally every word is a cat sweatshirt and perm waiting to happen. I’ve started using philosophy skin care products, and I realized that they actually work. As in, a wrinkle reducer ACTUALLY REDUCED WRINKLES on my skin. I bought shorts. I always swore that only ugly Americans wore shorts, and there is no reason you can’t try just a little bit harder and wear a cute skirt or capris or something. But you know what? I’m tired. It’s hot, I’m tired, and, okay, they’re actually pretty cute. And last night, I discovered that no matter how bad the day has been, how nicely the kids sleep, or how tasty it is, I can. not. do long island iced teas anymore. Oof. Morning, y’all. I’m back. Last week was…unpleasant. Very very unpleasant. 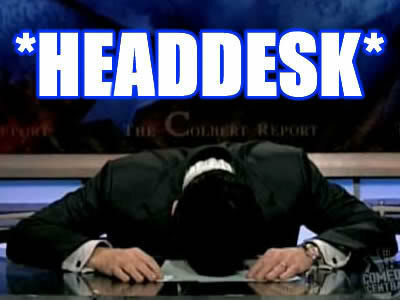 Like, my mommy had to convince me at several points that I only had a stomach bug and was not, in fact, dying. Because I’m dramatic like that. ANYWAY. 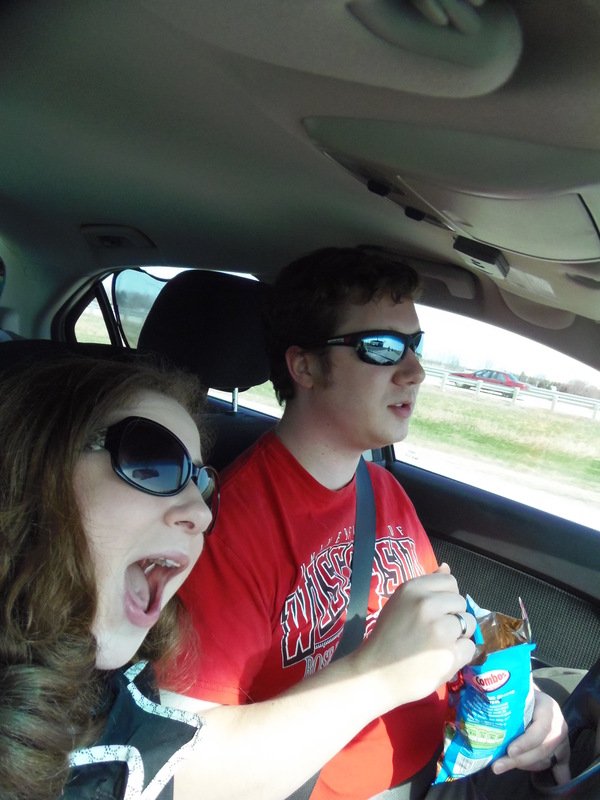 Before all that happened, we went to Door County for the day with my parents. We spend most of the time driving there and stopping at various stores, so most of the pictures don’t involve anything actually in Door County, but I digress. 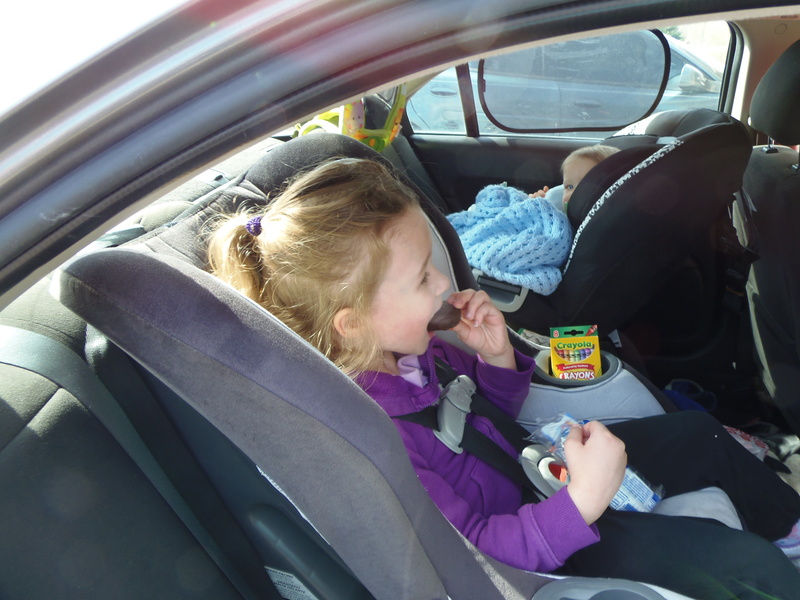 Squeaks is legitimately excited because she gets to eat donuts in the car, which does not happen every day because while I’m nowhere near as good and wholesome a mother as my Pinterest boards suggest, I have some standards. Buzz is also excited because for all his whining about how when his family goes to Door County they actually, you know, like go to Door County, he gets Twinkies. My family took a lot of road trips when I was little. 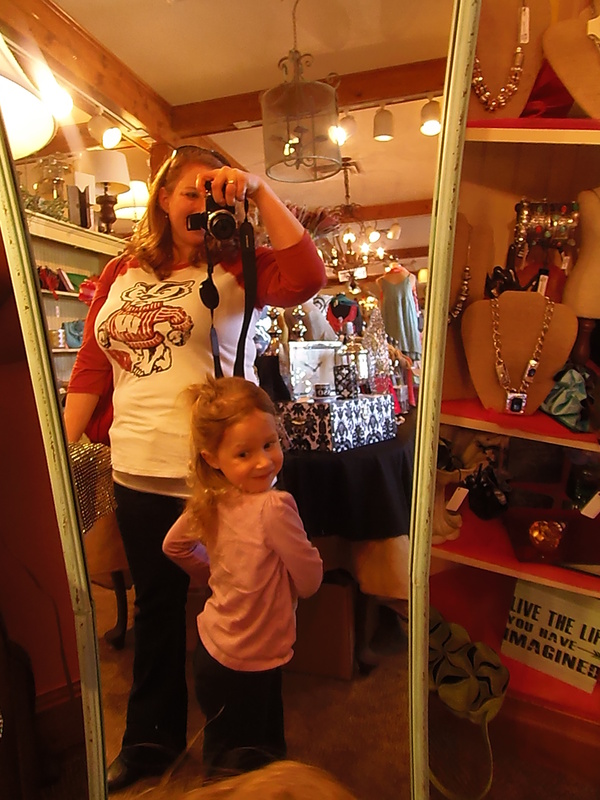 We’d follow my dad around on business trips throughout the state, and we went to Galena every year. I have such good memories of being in the car with everybody, and it makes me so happy that my kids are getting to experience that. Of course, it’s way more fun if we can all be in one car, not caravan-ing it, because my sister is hilarious when she’s a.) drunk, b.) tired, c.) in enclosed spaces. But with Buddy’s arrival we can’t all fit in the Astro. Sad face. I don’t know why he married me. 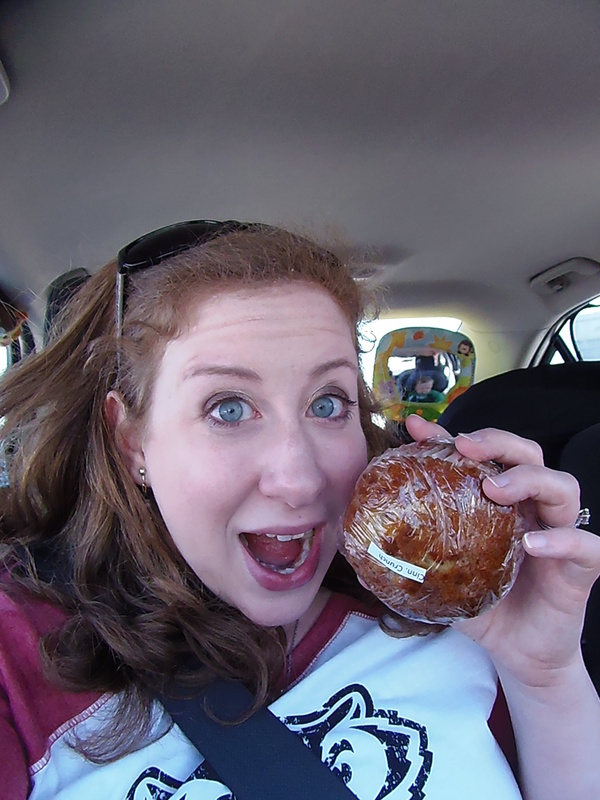 We always stop at this random gas station and get muffins about halfway through. 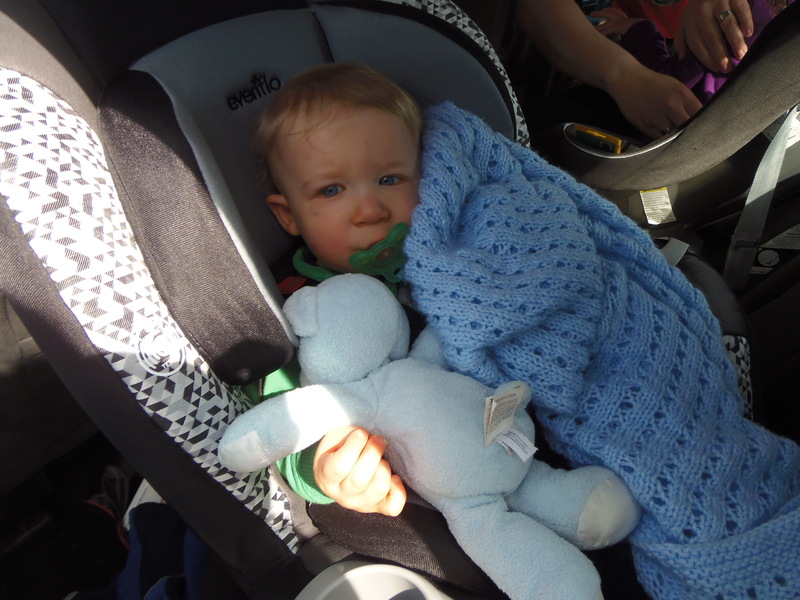 Last time we went, Buddy was three months old and I gave him a bottle here. 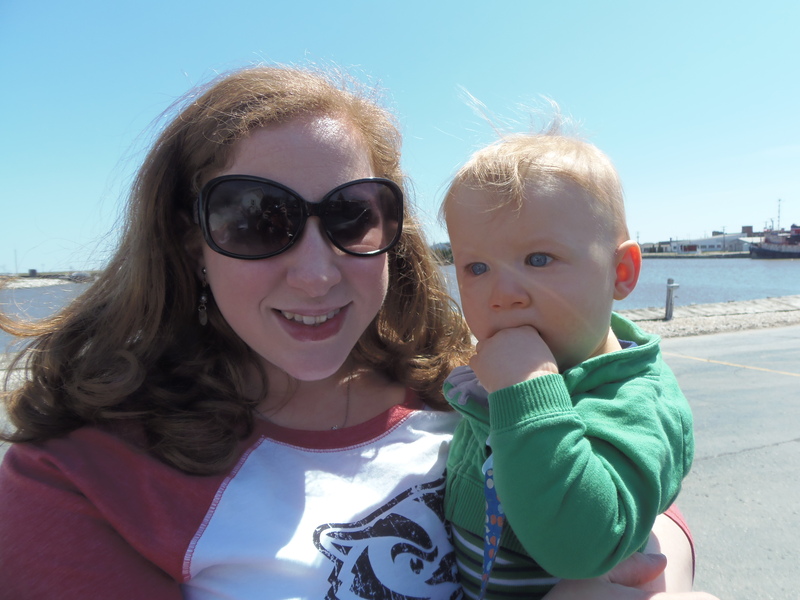 So there are lots of pictures of me bouncing him around trying to get him to eat, which he did not enjoy doing, and looking for the Prozac bottle. 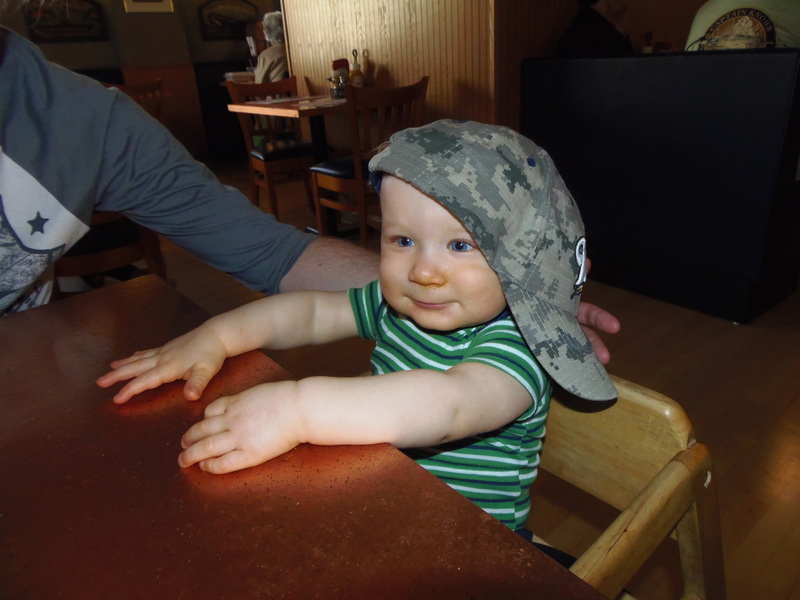 This time, he’s 10 months, eating solid food at restaurants when we stop (such a convenient, easy-going baby) and falling asleep on his own. I like 10 months. A lot. The first actual stop in Door County is the Door County Coffee store. Where I stock up on highlander grogg, pumpkin spice (in season), and take pictures of my daughter dancing in the mirror. 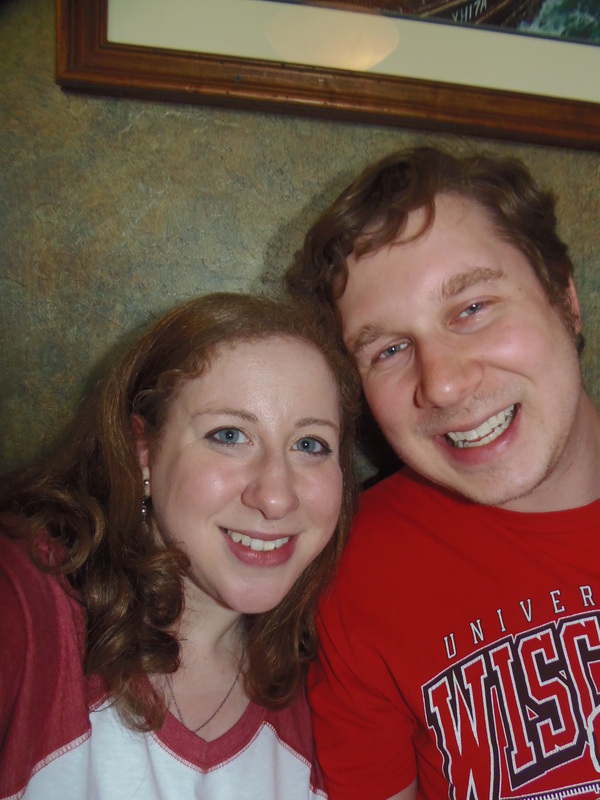 We had a wonderful lunch, and I apparently stopped taking pictures after it. 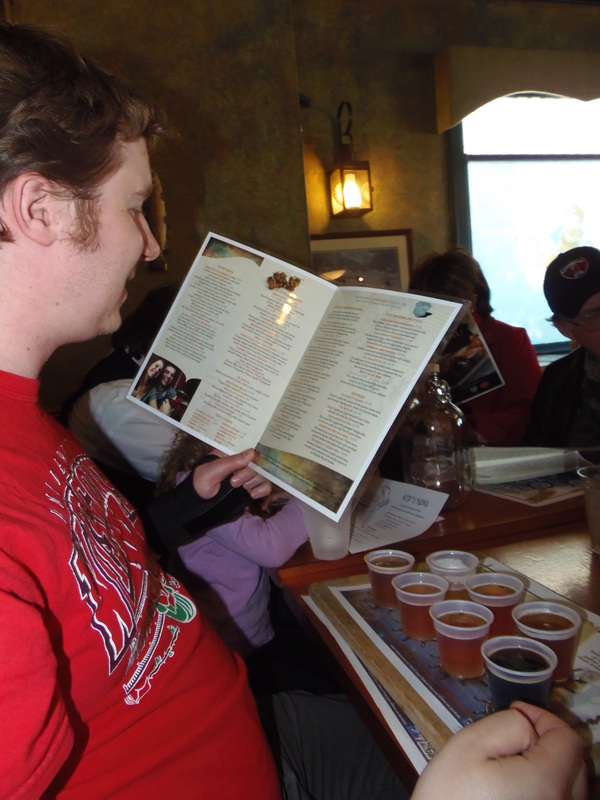 Buzz enjoyed a beer sampler, of course. Oh, except for a few selfies. Obviously. 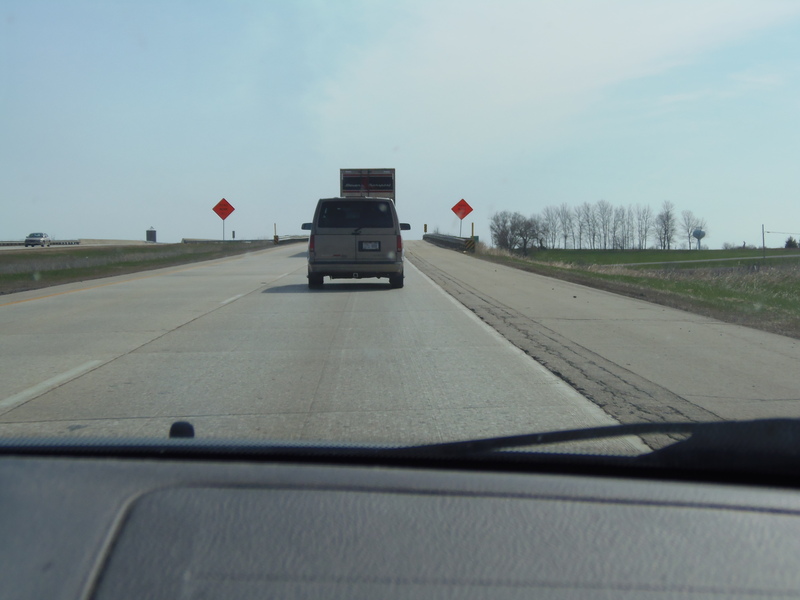 We took a huge, long road trip out east in 2010. We were all adults; it was the summer between college and grad school for me, and I think the five of us knew we were pretty much on borrowed time. 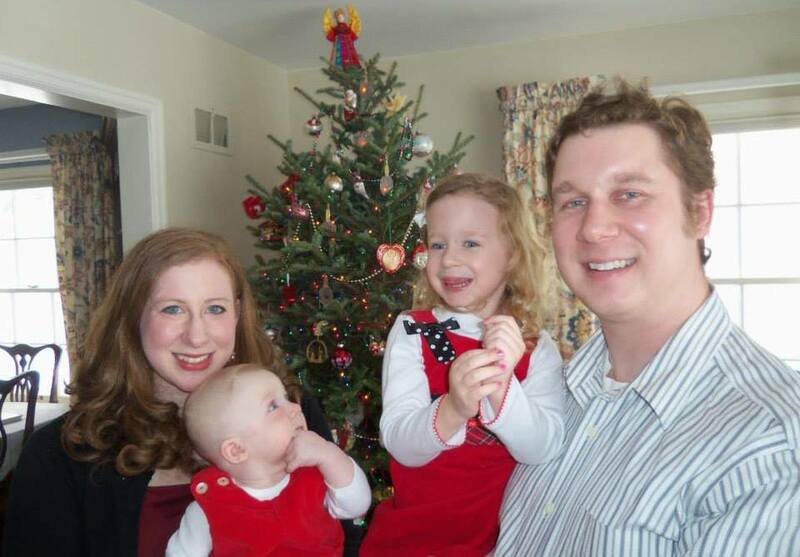 Within a few months of getting home, my sister and I would meet our husbands, and things changed. I was worried that the way I traveled with my “growing-up family” wouldn’t work anymore. But even though it’s changed with the addition of children and husbands and craziness, I am so, so pleased to report that it’s just as wonderful as it always was. Which is, apparently, Mother’s Day. Which I really need to start checking before I buy majorly expensive gifts for people. Which is why I spent last night not with my children or mother but at a comedy show for my husband’s birthday. Which was amazing and funny and we had a great time and I love him, but still, you know, babies. Anyway! This weekend was incredibly busy, so I have a headache, indigestion, a house that looks like a bomb went off, and no pictures of me and my children from yesterday. We did get some on Saturday, though, but I really feel like the family odyssey to Door County deserves more than a sentence. 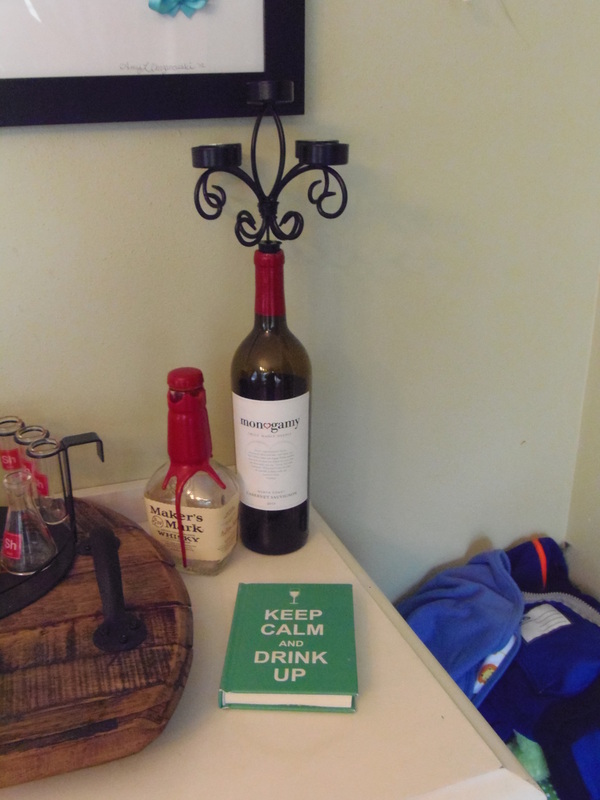 Wine bottle candelabra and awesome book filled with cute booze sayings. He knows me so well. 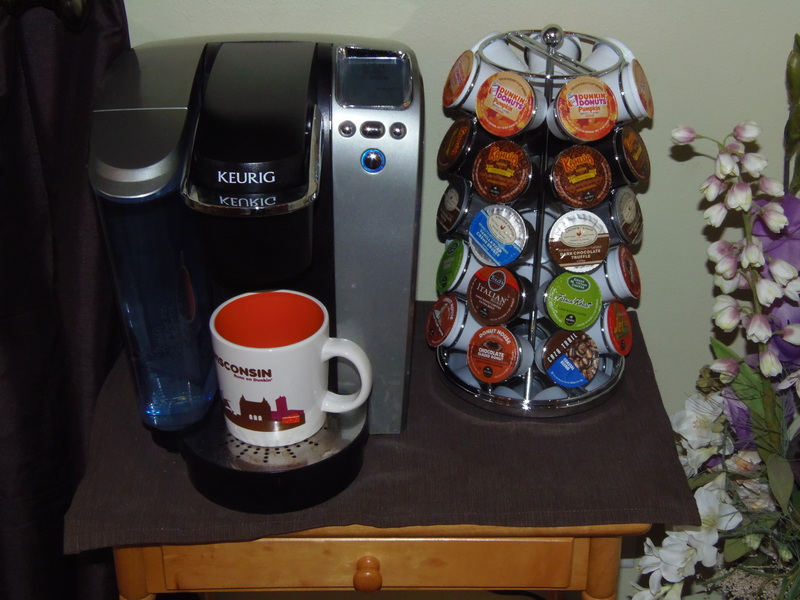 ADORABLE K-cup holder from my in-laws. So. Cute. My grandfather-in-law also made me this gorgeous piece of woodwork that’s…I don’t know, like a valet or something? I’m using it in the kitchen as kind of a family workstation. It’s beautiful and I love it so hard. It makes mail fun. 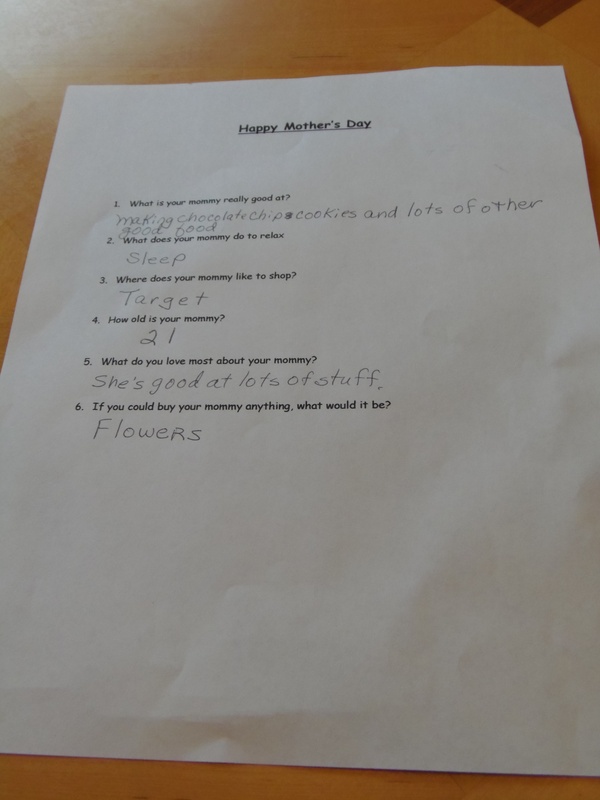 She and her grandma also made a series of questions with her answers for me.. I am beyond enchanted that she thinks I’m 21, and she is spot-on with the Target and sleep. Observant kid. Also, the “lots of other good food” is kind of adorable given that she WON’T EVER EAT DINNER. It made me realize, again, how lucky I am to have them. Mother’s Day, like some other days, in our house is not an entirely happy occasion. It’s not that we’re sad all the time or Buzz doesn’t make me feel special or anything, but when people you love are in pain it’s impossible to not feel for them. When my husband and family (and eventually my daughter) hurt, it’s impossible not to hurt for them. But I would so much rather have this life, with this husband who makes me feel so loved, and these two perfect children whom I will hold and hug and thank God for as long as He will let me have them, than any other. And I think that’s really what Mother’s Day should be about.